Is it dangerous to climb Huayna Picchu? For lovers of adventure, Machu Picchu also has something to offer. This is the climb to the top of the mountain Huayna Picchu, considered one of the most incredible short walks on the planet. 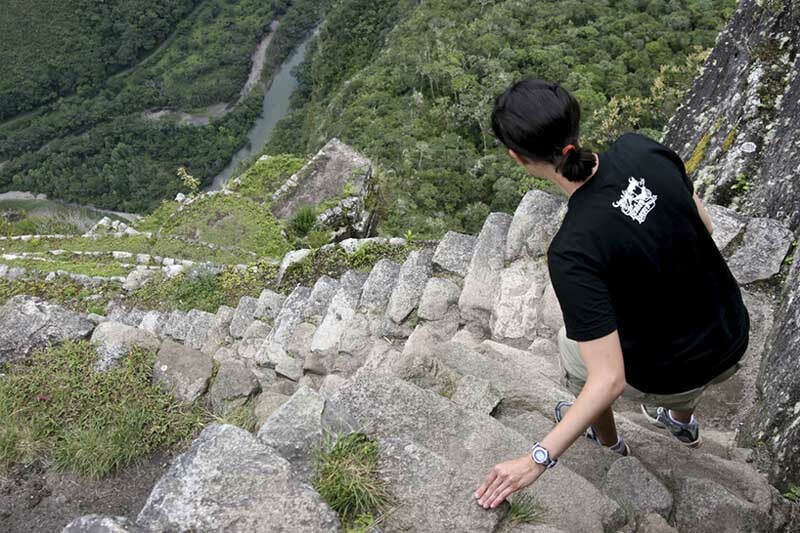 Every year thousands of visitors dare to travel the ancient Inca trails on the edge of fearsome cliffs. However, there are some tourists who do not dare to live this adventure for fear of accident in the attempt. But is the Waynapicchu mountain really dangerous? The Huayna Picchu is the mountain that is located north of the Inca archaeological site and 2,720 meters above sea level. In its interior, is the Grand Cavern or Temple of the Moon, a mysterious building in the middle of two caves. From the Inca Citadel it can be seen as a steep summit with a difficult route and indeed it is. Inside, the Incas made stone staircases with complicated slopes. In some stretches, these are bounded by fearsome cliffs. At the top of the mountain you can appreciate the geographical beauty of the Wonder of the World like nowhere else. Despite everything, the adventure is recognized as one of the most incredible on the planet. Every year more and more tourists are encouraged to experience the adrenaline rush of Waynapicchu. The ascent – The route is difficult. It begins with a slight ascent along trails. The first difficulty is to go through a huge rock whose only possible way is a narrow opening. The ascent continues up some stone staircases of reduced space. On one side it borders the rock wall of the mountain and on the other a cliff several metres long. The view is terrifying. However, if fear is overcome, you will reach the top. It is estimated that the ascent takes 1 hour depending on the physical condition of the tourist. The highest-the top of the Waynapicchu is the perfect reward of the effort deployed. From that point you can appreciate the Inca citadel and the nature that surrounds it as in no other place. The highest point of the mountain is 300 metres higher than the archaeological site. From there you can also see the village of Aguas Calientes, the Vilcanota River, the Putucusi and even the Salkantay snow. It is believed that the proximity to this nature and mountains was the reason why Machu Picchu was built in that place. The descent – The descent is as arduous as the climb. It starts on a different path to the ascent. In a section there is a detour that leads to the Great Cave or Temple of the Moon. The stone stairways are also narrow and next to precipices. These join at a point with the initial path of ascent. It is estimated that going down from the top of Huayna Picchu takes 1 hour depending on whether or not the visit to the archaeological temple is made. In the final part of the ascent to Waynapicchu there is a section called ‘the stairs of death‘. This nickname is exaggerated since in reality no one lost his life when falling from these stairs. These are named after the verticality and difficulty of the section. It is the last stumbling block before reaching the top of Waynapicchu. The feeling of vertigo and adrenaline in this part of the road is one of the most extreme moments of the ascent. The route through the Huayna Picchu mountain is difficult and vertiginous but not really dangerous. In the most complicated sections at the edge of the cliffs there are safety ropes that help to overcome them. There are also qualified personnel to assist tourists who need some kind of support and signposting along the trails. At the beginning of the route it is compulsory to register the personal data of each person who enters and leaves the summit. In this way, the authorities assure that all those who enter, leave the place. Access is only allowed to people over 12 years old. The adventure is not recommended to people who fear height or heart problems. In social networks and tourism forums such as Facebook and Tripadvisor there is a variety of information about the dangers of the Waynapicchu mountain. Most agree that the route is difficult and scary but not dangerous. If all recommendations and safety measures are followed, the danger is nil. However, there are cases of tourists who risk their lives unnecessarily by taking a photograph near the cliff or looking for a path outside the permitted paths. In those cases accidents can occur. Any experienced climber is aware that any mountain must be treated with respect. You should take precautions and not risk your life unnecessarily. If you suffer from vertigo or fear of heights, we recommend you ignore the Waynapicchu. You can get wonderful aerial views of the Inca Citadel from the top of the Puerta del Sol or the Machu Picchu mountain. If you wish to choose the dates on which you wish to ascend to the Huayna Picchu Mountain, you must book the tickets with up to 3 months in advance. It is only allowed to carry a backpack no bigger than 5 kilos. It is advisable to bring only what is necessary: water, hat, sunscreen, mosquito repellent, poncho in case of rain, snacks and a camera. Climbing to the top of Waynapicchu is a challenge. You just have to do it at your own pace. Many older adults also dare to reach the top. Group 1 can stay at Machu Picchu from 06:00 a.m. until 01:00 p.m. Group 2, from 06:00 a.m. until 02:00 p.m.